next April 2, 2015 5:47 p.m. The real saviors of football aren&rsquo;t in league offices &mdash; they&rsquo;re in laboratories. 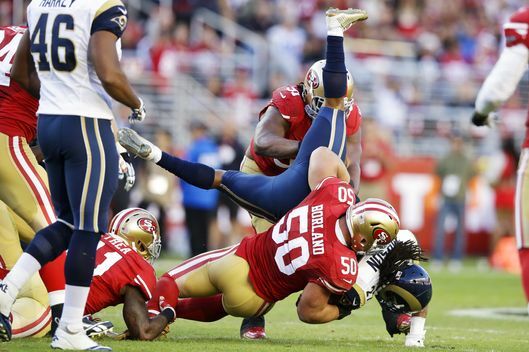 In early November, former 49ers linebacker Chris Borland played the game of his life. Replacing injured star Patrick Willis in the starting lineup, the 24-year-old racked up a ridiculous 18 tackles and looked like he’d fit in as well in WWE as he did the NFL. The Niners appeared to have found their defensive leader for the next decade. And then, as quickly as he emerged as one team’s savior, Borland became the entire league’s nightmare when he abruptly retired because of the dangers inherent to the game. In Borland the NFL had a future star turning down millions because he found football too risky. As he put it on CBS’s Face the Nation, “I was concerned about neurological diseases down the road if I continued to play.” Football’s future depends, in part, on preventing defections like Borland's — not just by NFL players but, perhaps even more important, by the youth-level players who provide the never-ending stream of new players. And there’s concern that this battle is already being lost — a 2013 ESPN report found that youth football participation is dropping, and one recent survey showed that half of all parents wouldn’t want their young son playing football. Like any multibillion-dollar corporation, the NFL isn’t going down without a fight. The league runs one program to teach young players proper tackling technique and another to convince moms to let their kids keep playing; it also tries to paper over problems with PR and engages in a somewhat nefarious attempt to infiltrate America’s schools. But the real saviors of football aren’t in league offices — they’re in laboratories. The NFL’s obvious need for reform has academic researchers and tech entrepreneurs racing to invent the products that will save football. If the NFL even has a future, it’ll look different from its present — at least on the sidelines, where mouth guards with built-in accelerometers and gyroscopes could replace the plastic currently in use, tablets tied to helmet sensors could identify dazed players, and blood tests and virtual reality machines could replace clinical concussion tests. These innovations can’t come fast enough. Last month, with about 11 minutes to go in Super Bowl XLIX, Patriots wide receiver Julian Edelman made a crucial third down catch at midfield and immediately got rocked by Seahawks safety Kam Chancellor, one of the league’s hardest hitters. Somehow, Edelman stayed on his feet for another 10 yards, finally stumbling to the ground at the 40. When he got up — or tried to get up — he was visibly shaken and looked, to many of the people watching him, obviously concussed. But he stayed in the game and went on to play crucial role in the Patriots' win. Just this week, the NFL adopted a new rule to prevent players from taking that sort of risk. The “Julian Edelman rule,” as it’s called, allows independent sideline watchers to signal to officials and stop the game if it appears a player will remain on the field after showing “obvious signs of disorientation.” Instituting this rule is a step in the right direction for the NFL — but it’s exactly this kind of eye-test diagnosis that might be the first to be replaced by an emerging technology. 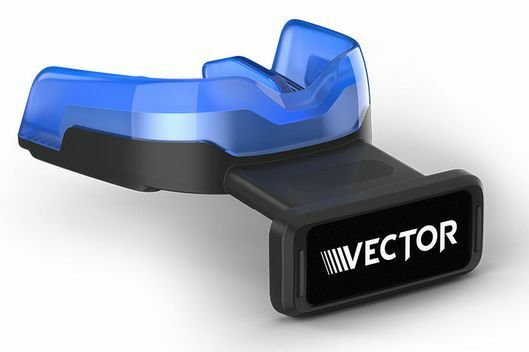 The Vector mouth guard from i1 Biometrics has already made inroads in the college game. With an embedded accelerometer and gyroscope, the mouth guard is able to monitor head movement and detect hits that could result in a concussion. That information is relayed to trainers on the sidelines, who can tell coaches when a player should leave the game. 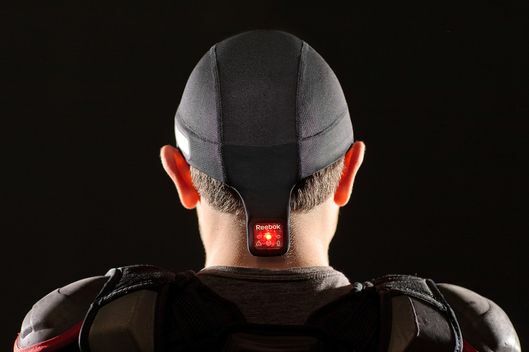 Reebok has teamed up with wearable electronics company MC10 to make the CheckLight, a skullcap that's thin enough to be worn under a helmet and that can measure the impact a player absorbs on each hit. Seattle-based X2 Biosystems's xPatch relies on tiny sensors embedded in a sticker that goes behind the ear. The form of the devices may be different, but they all work on the same principle — tracking head motion after a hit and relaying that information to someone who can act on it. “In the short term, it gives coaches and trainers much better tools to make a decision about whether an injury is severe enough that a player should be removed from play,” says John Ralston, CEO of X2 Biosystems. Unlike an ankle sprain, a concussion is not always visible, and according to one study, more than 80 percent of potential concussions are unchecked because players never mention them. With these sensors, a trainer knows a player’s head sustained a worrying hit and can pull him aside to conduct a test, even if no visible signs of concussion are present. The real benefit of these sensors, though, is that they can highlight what's putting athletes at risk to begin with. “We can make all sports safer and I think we can do it by identifying the particular actives that are highest risk and then modifying the activities to reduce the risk in them,” says Dr. Robert Cantu, a Boston University concussion expert. The sensors produce reams of data, showing location, severity and frequency of hits to the head, and Jesse Harper, CEO of i1 Biometrics, says the information gleaned from his company's mouth guard can help identify drills in practice that are causing significant impact to the head or athletes whose improper technique puts them in danger. In the long term, "an enhanced focus on technique coaching and behavior modification may lead to lower incidence of future injuries,” he said. In other words, technology can illuminate the game’s dangers and make it easier to see the habits and rules that need to be changed. He would know. He’s spent the last eight years using sensor data to help establish a rating system that claims to identify helmets most likely to prevent concussions. The ratings aren’t without controversy — critics say by only considering linear acceleration, and not rotational acceleration, the ratings encourage manufacturers to produce even more dangerous helmets — but they show the sensor data is useful, which the NFL seems to be denying altogether. If the first step in football’s technological revolution is measuring hits to the head, the second is changing what happens after those hits. The current method for diagnosing a concussion on an NFL sideline works like this: Player takes hit. Trainer observes symptoms. Trainer administers concussion test — the player must identify the month, year, and time of day and recall a list of words, among other challenges. Those who fail are taken to the locker room and those who pass return to the game. Several doctors believe they have a better way. There are a handful of video-game-like tests that evaluate a player's memory, reaction time, and speed. Measured against baseline test, they can reveal a potential head injury. Emory University’s iDetect takes that concept a step further, with an immersive display meant to be used on the sideline. By tracking eye movements and cognitive function, iDETECT “measures the dysfunction that occurs immediately after a concussion,” says David Wright, director of Emergency Neurosciences at Emory University School of Medicine. NYU neurosurgeon Dr. Uzma Samadani has invented another concussion-testing device that tracks eye movement: The eyes of people with brain injuries tend to move out of unison but often in too subtle a manner for the naked eye to observe. Replacing paper tests with more reliable screening methods could go a long way toward preventing the next Julian Edelman. An eye-tracking device next to each Gatorade cooler would stop players from stumbling toward the sideline and fudging their way through a concussion test. A defiant player or coach would also have a hard time ignoring the orders of a team doctor in the presence of an objective test that proves he’s concussed no matter how he feels. Combined with the head sensors, these advanced tests have the potential to root out the most common concussions—those that aren’t obvious from the sidelines and don’t cause severe impairment. Those are extremely dangerous, especially when they go undiagnosed and a player suffers another before the first is healed. On the sideline of the future, potential concussions will be quickly identified and reliably diagnosed. More players will be forced to miss time while recovering from head injuries, and that's a good thing. Even if they spend less time on the field in any particular game, players who stop when they get hurt stay safer and have longer careers. Ultimately, for these technologies to help secure the future of football they'll have to do more than diagnose concussions though. The game's continued success relies on changing the masochist, gladiator mentality that has players believe they're not hitting hard enough if they're not getting concussed. A good step in that direction is coaches, players, and trainers using all the available information — be it sensor data, scientific research, or other player's experiences — to better understand what a concussion does to the brain. That might push some players, like Chris Borland, to leave the game. But for many others, it will lead to a safer, more sustainable future for football.